Hey, Smalls, you want a s’more? I can bake with the best of them. I’ve made apple tarts, mac and cheese bites, gingerbread biscotti, and chocolate lava cakes – all from scratch. Sometimes, you need something that’s tasty and quick. Quick being the operative word. Like when your husband calls you and tells you he just got a big promotion and it’s raining outside and it’s rush hour and there is no way you’re getting to the store. This dessert is perfect for such an occasion. What is it? S’more brownies. 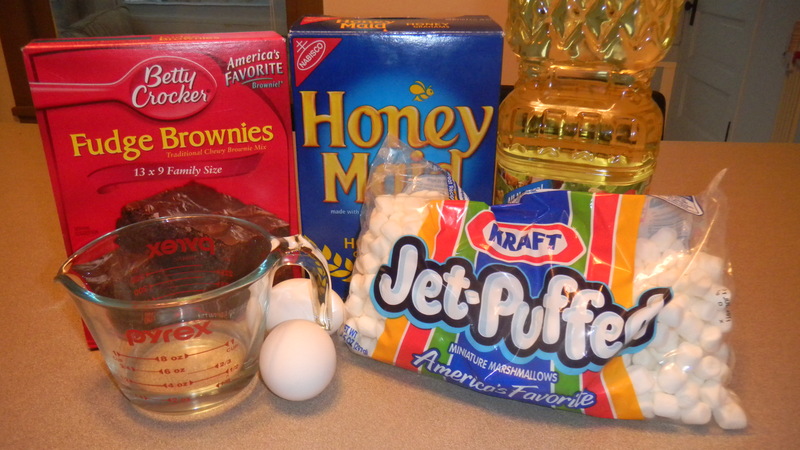 Start by making brownies from a mix. Just follow the directions on the box. I only had to add water, 2 eggs, and vegetable oil. I used a family sized mix, but used a smaller pan. That way, the brownies would be thicker and more substantial. I baked them at 350 degrees for about 40 minutes. I stuck the brownies with a toothpick, and when it came out clean I took the pan out of the oven and let it hang out on my stovetop to cool. You don’t have to let the brownies cool completely, but I had some time before I was serving them, so I just let them sit there. 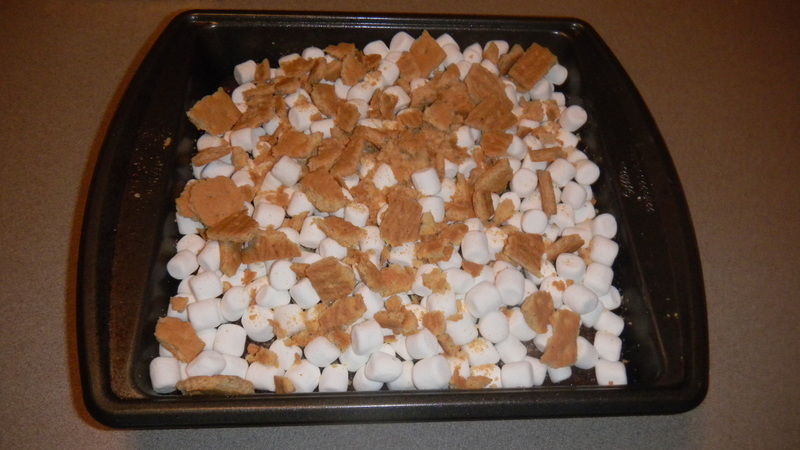 About 5 minutes before you serve them, pour marshmallows over the top of the baked brownies. I haven’t cut them into individual squares yet. Put enough so you can’t see the brownies underneath. Next, take 4-6 graham crackers and break them apart in your hands. Put the grahams on top of the brownies. Turn on your oven broiler. Put the brownie pan in the oven, on the rack closest to the heat. Only leave the pan in there for a short time. I leave the oven light on so I can see the marshmallows roasting. This step is basically the equivalent of roasting the marshmallow over the campfire when making s’mores. Some like their marshmallows a little toasty, while others like them almost burned. It’s personal preference. 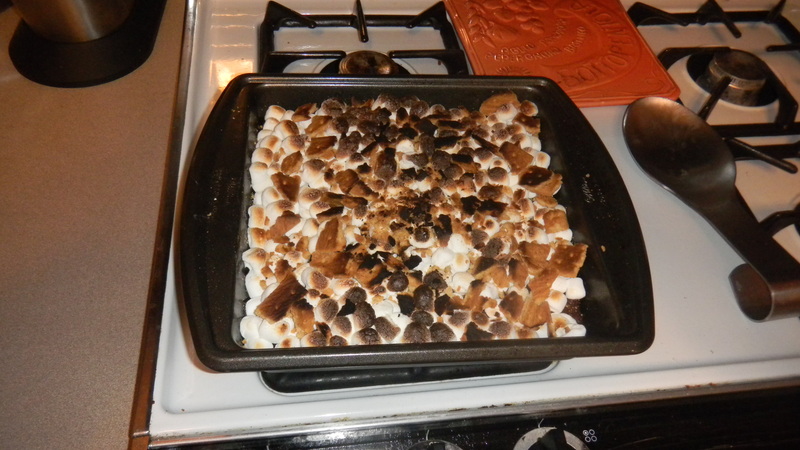 Once your marshmallows are just the way you like them, take the pan out of the oven. Cut the brownies into pieces and serve immediately. 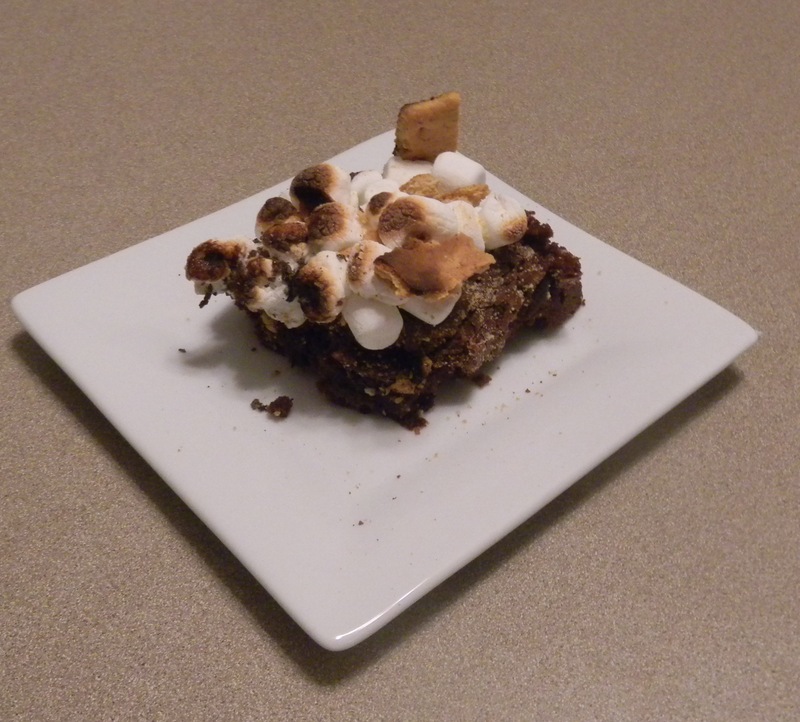 Note: just like s’mores, these brownies can be quite messy. But they are super yummy. For extra yumminess, add some chocolate ice cream on top. Enjoy!